Windows 7 market share crosses 25%; XP drops to 50%! According to StatCounter, Windows 7 market share now stands at 25.12%, while Windows Vista has been steadily declining and now stands at 15.9%. Not surprisingly, Windows XP market share has also dropped. While it stood at 65.12% in Dec 2009, it has now dropped to 50.65% in Dec 2010! 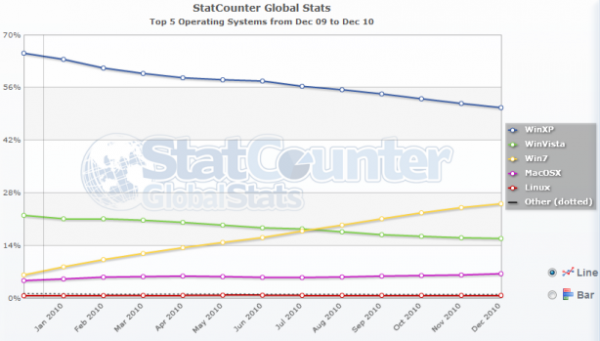 MacOSX has grown marginally to 6.54% while Linux has been more or less constant at 0.78%. Windows 7 has been very well received by both consumers and business and boasts of a very high satisfaction rate.